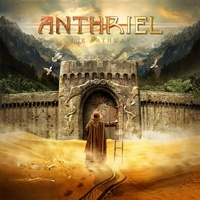 Anthriel is a new band from Finland and with The Pathway they try to conquer the metal world. They kick off with Devil's Lullaby, a heavy but melodic track which offers neo-classical elements, symphonic passages and progressive parts. Singer Simo Silvan partly reminds me of Andy Engberg (Section A, ex-Lion's Share)... Simo Silvan has a powerful voice, adding melody and if needed aggression. The opening of Mirror Games seems to cite Peer Günt, but then the band storms off into a symphonic power metal tune. Timo Niemistö heavy riffs and Antti Hakulinen's keyboard accompany the rhythm section - bassist Klaus Wirzenius and drummer Jari Kuokkanen - and together they deliver the playground for Simo Silvan. It seems that with every song they show a new facet... The 2+ minute long instrumental Repression is more an interlude building a bridge between Guardian and Haven Of Grace. One of my favorites is Haven Of Grace, especially due to Silan's expressive vocals, but also due to the twists and turns the song offers. Dark Divided Minds might catch the interest of Evergrey fans, as it's dark, powerful, symphonic and emotional. At Control Euphoria you'll find a passage which could have been taken off a Kamelot album... The closer Chains Of The Past is almost 14 minutes long, starts slowly with a symphonic passage, but then speed up. The heavy riffing is accompanied by a folk-ish keyboard, but that's just the beginning. Let Anthriel take you onto a sonic journey! If you are into progressive power metal, if you like powerful symphonic metal. then head over to Anthriel's MySpace and check them out. Let Anthriel enchant you! Be aware, Anthriel's music is highly addictive!